Affordable Inspirational Living - on trend, quality products to style your home. The Akai 46 Bottle Wine Fridge. This is a capable wine refrigerator that maintains a reasonably constant temperature (important to ensure wine quality does not deteriorate) with a tolerance of +/- 1 degree C. It is advertised as holding up to 46 bottles, but I was only able to force-cram in 39 bottles. I doubt whether 46 "Burgundy-style" bottles would fit in, as claimed by the manufacturer. The biggest issue is that the refrigerator is supposed to come with six shelves. I bought two refrigerators and both only had four shelves, so it's impossible to have 46 bottles stored inside. The Warehouse said they would fix this issue, but that was over a week ago. I'm not holding my breath. The fridge is OK. The measurements are correct as advertised, but as you can see from the photo it only holds 32 bottles instead of 46. 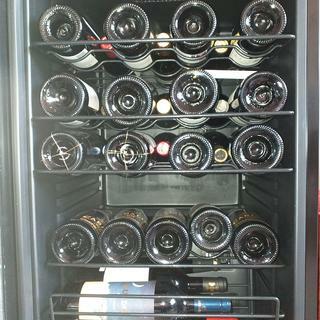 If we could get another rack we can possibly fit it in an then it could hold 39 bottles.